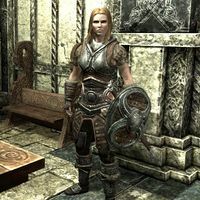 Jordis the Sword-Maiden, a Nord warrior, is a housecarl assigned to you upon becoming a thane of Solitude. Jordis is eligible to become a member of the Blades, and is also a potential candidate for marriage. Jordis is clad in steel quality equipment; she wears a set of steel armor, a pair of steel Nordic gauntlets and a pair of steel cuffed boots. She uses a steel sword to attack her enemies and blocks with a steel shield. When you become a thane of Solitude, she may still not spawn, but using the console command player.moveto will place you next to the bench in the living room area. This indicates that she does exist but is not displayed, nor can she be interacted with. This can be fixed by entering the console and typing prid A2C95 then disable and enable. She will then appear next to you. This page was last modified on 15 November 2018, at 20:55.